Did you know that … Indaten® can change naturally? 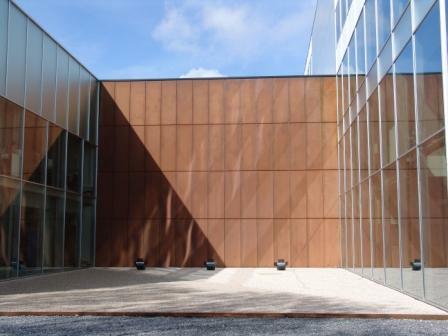 The new Metal Structures Centre (MSC) in Ghent (Belgium) features a central wall which is clad in Indaten® weathering steel. 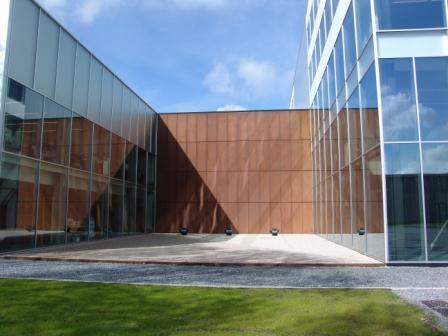 The wall is visible from the offices, meeting rooms and laboratories of the MSC, giving the building’s users a direct visual connection to the material they are researching. A unique hanging system was developed for this project. Known as Cassette MD, the system consists of a custom-made flat Indaten® cassette with an articulated joint. Each cassette is hooked onto a secondary structure and a gully is left between each one. Rainwater falling on the panels is directed into the gully and away from the wall. Unlike other installations of Indaten®, the steel has not been pre-treated to advance the aging process. Instead, the steel is being allowed to naturally acquire its distinctive rust colour. As the first image shows, Indaten® begins life with a very light colour. Over the coming year the panels will continue to darken as the protective oxide layer forms. New pictures of the wall will be added to this story on a regular basis to show you the aging process. Are you interested in Indaten®?